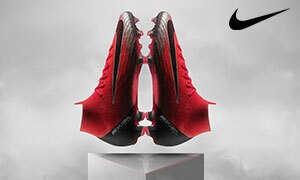 A finisher’s boot, with the aspects of power and precision combined into one, that’s what the Nike Phantom Venom is. Nike has worked on this type of project for a while now, first releasing the Total90 series as that power boot with rubberized striking elements back in 2000. 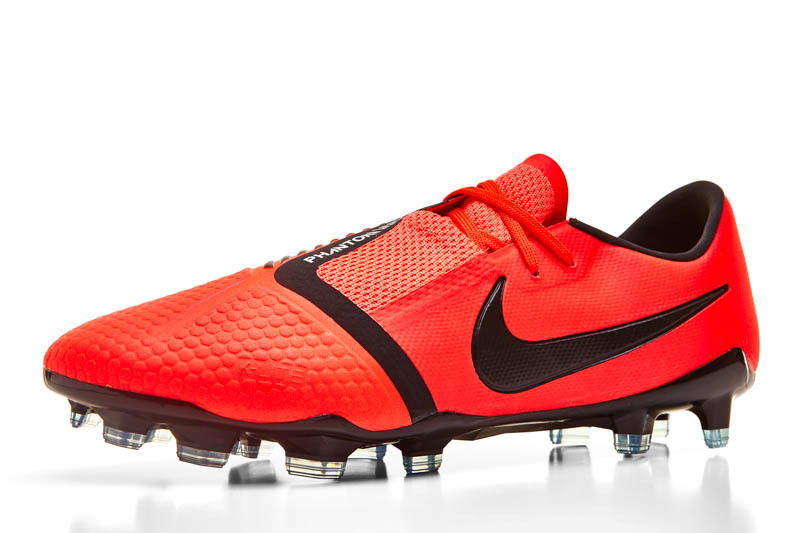 Nike’s next evolution of that idea, replacing the T90 line, was the Hypervenom line in 2013. It had a great start and reception as well as some bumps in the road, **cough Phantom 2 cough. 2019 has come around and with Nike’s two-year silo rotation (every two years in a silos life being on the market, Nike will “improve” or replace that line completely) the time came to replace the Hypervenoms. 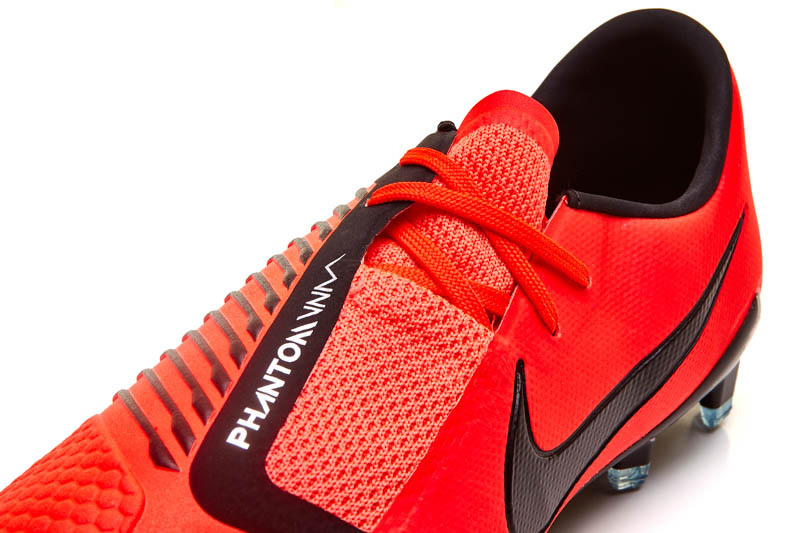 The PhantomVenom was released January 14th, 2019 and took the football market by storm. 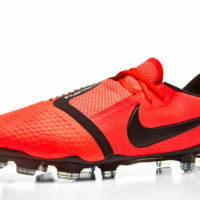 It has the striking elements of the T90 series and the sleek speed-boot feel of the Hypervenom. Clearly, everyone has been focusing on the Elite tier of the PhantomVNM, but I’m here to talk about the Pro model. 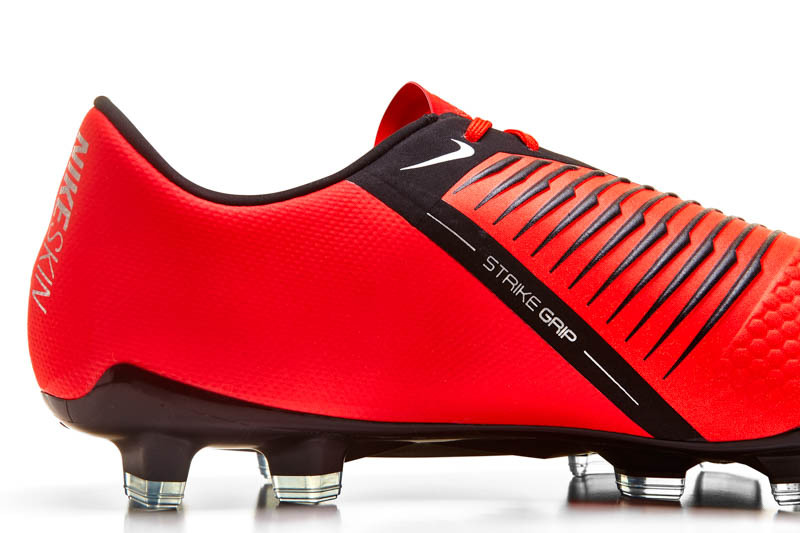 I’ll go into detail with a review about the boots and whether it’s worth the ‘modest’ $120 pricetag. 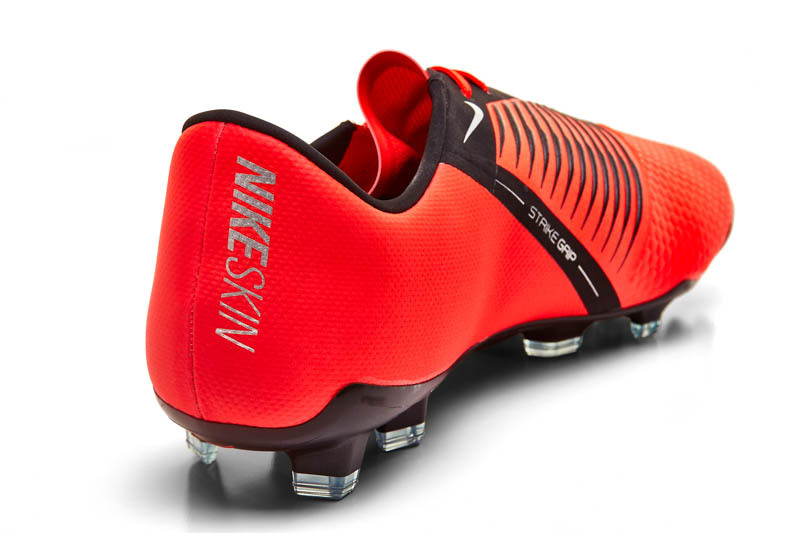 Nike has done a great job with keeping the Nike PhantomVNM Pro sleek and aggressive looking, a look that appeals with players of this age for sure. The look is very low-profile, probably thanks to the of the lowcut style that’s becoming less common with boots. The aggressive bit comes from the striking “elements” and bladed soleplate. 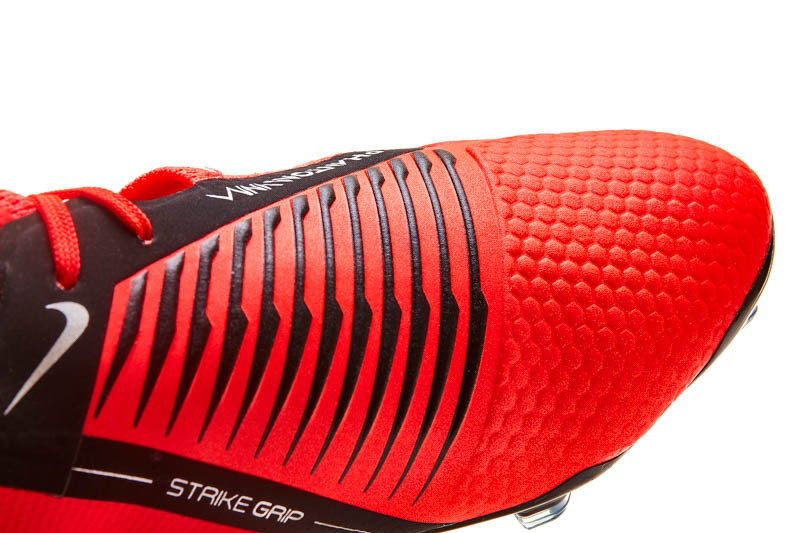 The HyperReactive soleplate is the same as the Elite models which makes for incredible value. The forefoot is very flexible yet remains solid, which I appreciate. The chevron style studs are extremely aggressive. It’s more aggressive than the Hypervenom and Mercurial Pro models in my estimation. The HyperReactive soleplate gave me amazing traction in all directions. I feel it’s a very great soleplate, however, it wasn’t not perfect for me. There’s no stud pressure but it is rather slim. My foot is a bit wider than the plate and I experienced a bit of rollover. That was a bit uncomfortable and contributed to some cramping. The PhantomVNM Pro’s striking elements are nothing more than pressed, raised K-Lite (I’ll get into what that is later) with a very subtle sandpaper-like texture. There are thirteen total striking “fins” placed where Nike has decided through its always-thorough research, is the best place to strike a ball to produce power and precision. Although Nike has justified the Strike Grip area, it doesn’t do much as far as I’m concerned. 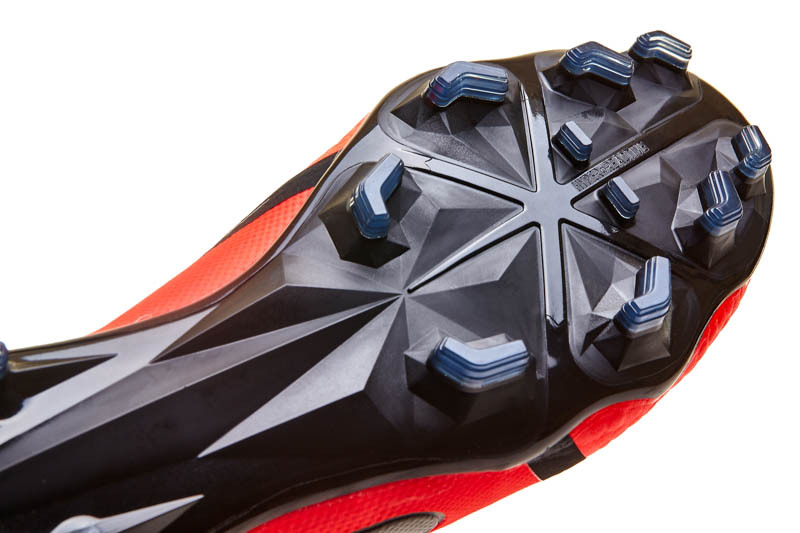 The “fins” aren’t like the original T90 series with rubberized elements that gave an actual punch and swerve on the ball. As I said before, they’re only raised parts of the synthetic used on the toe box and strike zone. Although the “fins” don’t do much as a striking element, the K-Lite upper does have a padded feel while striking the ball. It felt quite premium when I really powered through the ball, and I like that. I tend to like padded, leather-like feels, and the K-Lite, also known as Kanga-Lite, is just that. It’s a synthetic material that mimics the quality and feel of regular leather. K-Lite most certainly is not 100% like leather but does get close and as close as a synthetic will get you in today’s market. At first the upper felt overly padded. As I continued to break the boots in overtime, it began to soften up of course but didn’t lose the padded sensation on the touch. The K-Lite upper is quite responsive and felt to solidify right as I struck a ball for a shot. With the PhantomVNM Pro being my first boot to have a Kanga-Lite upper, I’m very satisfied with it. Nike did not use Kanga-Lite throughout the whole upper though. There is a seam covered by fuse material where the K-Lite and another type of synthetic meet. This second synthetic is basic from Nike, they call it NikeSkin. It’s a mesh-based synthetic and gets the job done. I haven’t noticed it while playing or practicing other than the harsh transition from K-Lite to Nike Skin. The PhantomVNM Pro’s NikeSkin is very thin but sturdy in a way. It fits very tight and close to the foot for a ridiculously pingy feel on each pass or touch. Some people may like that, but it certainly took me by surprise. 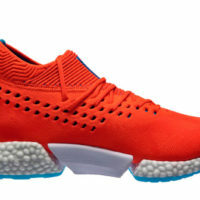 The upper goes from soft and cushioned, to thin and rigid rather swiftly. 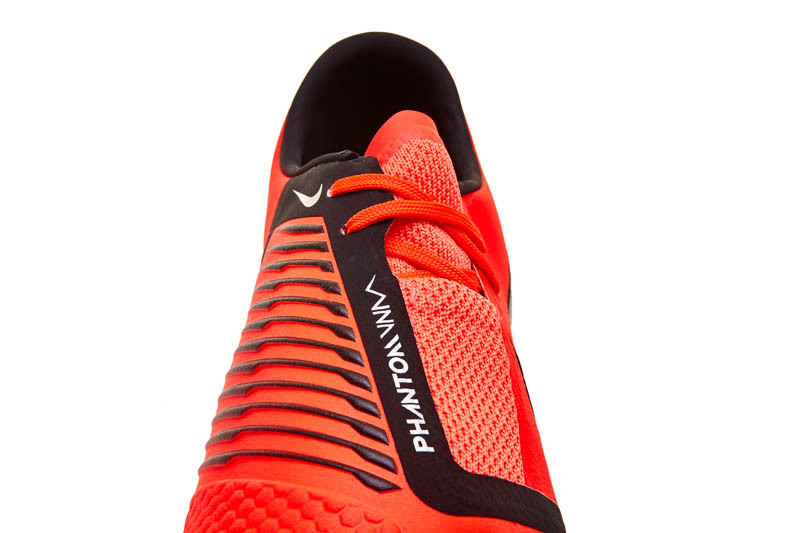 I am curious what the PhantomVNM Pro would feel like with either a full NikeSkin or K-Lite upper. The fit of the PhantomVNM Pro bothered my feet for quite some time. Not to mention, they’re extremely difficult to put on! The way Nike constructed these boots makes sense, but the materials used for the tongue and lace cover make it nearly impossible to put them on without cutting your thumb. Nike went with a woven mesh with absolutely no stretch for both the lace cover and tongue due to fuse material they used to cover seams. The lace cover, as shown in these pictures, is a bit small. I guess it is to make the boot a bit snugger fitting. They certainly accomplished that, and it adds 30% more striking surface, wink wink. The overall width of the PhantomVNM Pro is rather slim. It fits the form of its predecessor, the Hypervenom. This gave me some troubles during practice and play. On either side of my foot, I experienced cramps and discomfort because of how tight these boots fit. Regardless of how many times I attempted to loosen the boots, the slim fit would not give up which is great if you have slim fit feet but a major problem if your feet are wider. That is my only major concern/complaint about the PhantomVNM Pro. At the end of the day, bank for your buck is always the main concern, however with the PhantomVNM Pro that shouldn’t be a concern. The Pro model retails for $120, which is $130 lower than the Elite model. With all that Nike has given us on this boot, that is a great price. Although I personally won’t be wearing this boot primarily, I believe it provides the feel of a true finisher’s boot. The PhantomVNM Pro is very streamlined and feels so light on foot that I hardly noticed it. Kanga-Lite synthetic is such a great upper produced by Nike, I can’t think of another upper from Nike that feels so thin on foot yet so padded on contact, other than leather itself. Even if they’re ridiculously hard to put on and gave me some discomfort, the one-to-one fit of these boots is amazing. I am happy with the Nike PhantomVNM Pro’s performance and recommend this finisher’s boot to anyone looking to bury a ball in the upper 90. If you’ve got slim feet, these boots will make you sing for joy.